This solution includes a 2D galvoscanner system STRM-Q Series, a dynamic focus unit Proton Series, F-theta lens and a galvo system controller STRM-UMC4. 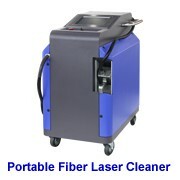 It uses the Post-Objective Scanning technology, the working volume is about 150*150*45(with the 210mm F-theta lens). The advantage of this system: marking fast, small focal spot, small loss. All of the above parameters are theoretical values. STRM-QP 20/30: 3D Pre-Scanning Solution includes a 2D galvoscanner system STRM-Q, a dynamic focus unit Proton series, and a galvo system controller STRM-UMC4. 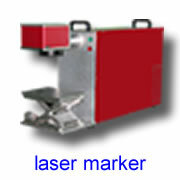 It uses the Pre-Objective Scanning technology to realize the large field and 3D laser application. The advantage of this system: fast, small focal spot, small power loss. 1. All of the above parameters are theoretical values. 2. Distance between edge of deflection unit and working surface. This distance is dependent on the product model and will vary with laser divergence and objective tolerance. 3. Actual spot size and writing speed are dependent on material and application. 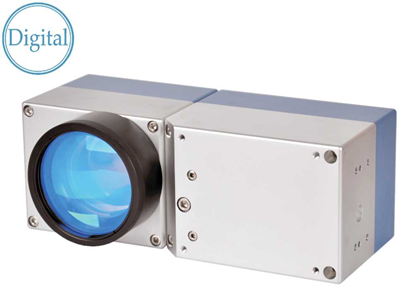 The dynamic focusing units of the LSSL-DNF series enable exceptionally precise, high-performance positioning of the laser focus along the optical axis. In XY scan systems this unit can replace costly flat field objectives. Therefore, the unit is an ideal solution in applications for which standard flat field objectives are unavailable. 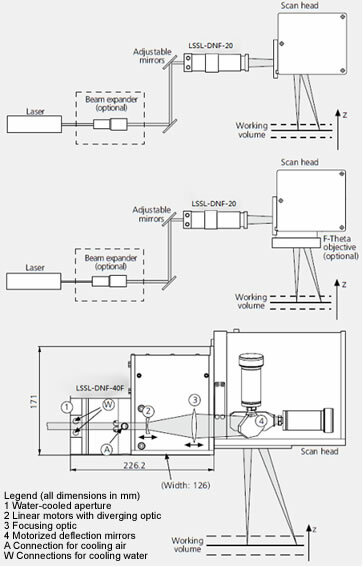 The LSSL-DNF series can also extend XY scan systems into 3D beam deflection systems. The laser focus is guided along the contour of the work-piece being processed, thus enabling processing in three dimensions. The dynamic focusing unit additionally allows continuously adjusting the image field size, working distance and spot size. The high-end member of the LSSL-DNF series of focusing units is equipped with a digital linear encoder. The LSSL-DNF series offers double the maximum travel of previous product and much lower tracking error, resulting in a larger focus-shift range and better spot quality. Its accuracy, speed, resolution and linearity, too, are clearly superior to those of all other units, while substantially eliminating the effects of drift. In addition, this unit delivers all advantages of driving technology: extensive flexibility, high dynamic performance, real-time querying of actual position and other status parameters, etc. During the scanning process, a diverging optic in this module is positioned with high dynamics along the optical axis with respect to a stationary focusing optic. This produces a change in the system’s overall focal length, synchronized with the mirror motion. 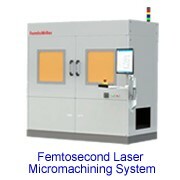 The dynamic focusing unit can thereby expand 2D scan systems into 3-axis scan systems. In 2D applications, this module can replace costly flat field objectives. In 3D beam deflection systems it enables processing in three dimensions. The focusing optic of the LSSL-DNF-40F is motor-driven, enabling continuously variable image field sizes and working distances. 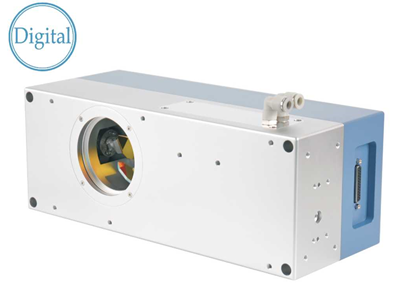 The LSSL-DNF-40F housing contains all optical components and the electronics. For scan systems with apertures exceeding 40 mm, we offer LSSL-DNF-60, 60I, 80 and 80I and the LSSL-DNF-FC. 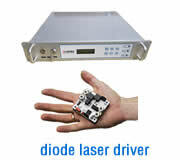 The dynamic focusing unit is equipped with a digital standard interface and is easily controlled – even synchronously with a 2D PC-based interface board scan system. The module is available for digital and analog-based control. 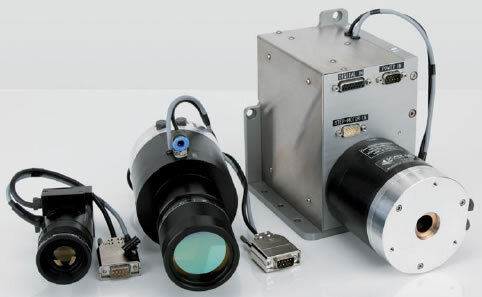 We offers dynamic focusing unit and the whole scan system – optical configurations for a wide variety of working distances, image field sizes, beam diameters, wavelengths and laser powers for optimally tuning the system to the customer’s particular application. Thus, a maximum image field size is achieved with the minimum spot size. 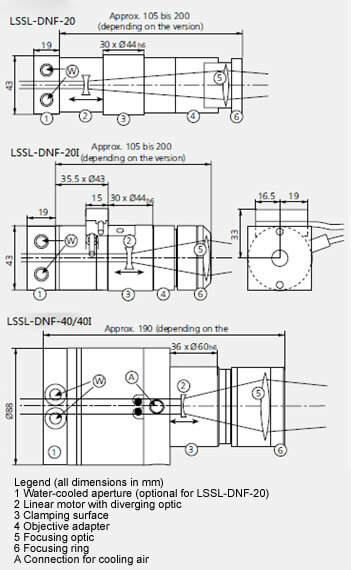 The LSSL-DNF-40 and LSSL-DNF-40I allows the customer to self-install various exchangeable optics sets. 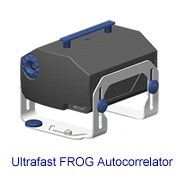 Their integrated air and water cooling ensure operation at very high laser powers. The LSSL-DNF-20I is equipped with a water-cooled entrance aperture.